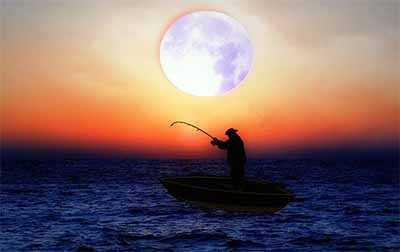 MoonSign.Today - Fishing By Moon Phase: Increase Your Catch! It is quite possible to always obtain more than the others think. Probably, you may gain more than you have dreamt yourself. How to do that? Well, you can do everything beforehand. Having the precise or close to those predications, you will be capable to have a well-organized plan. All fishermen can catch more, if doing everything correctly. Commonly, anglers go fishing in the most suiting them time. Nevertheless, it is far not always the precise and perfect time for fishing. No matter how good your techniques and baits are. You may catch all, but nothing. You can make great use out of "Solunar Theory" to have a really huge catch. You should to know that all the indications and instructions concerning this theory are pretty complicated, inasmuch as you ought to be on the fishing place precisely when it is said. Even a minute of delay may destroy all of your dreams. You find this either boring, or not real. However, those who risked that weren't disappointed at all. Perhaps, it is worth trying. If you aren't still convinced that this thing really works, you should start a diary of your fishing trials. 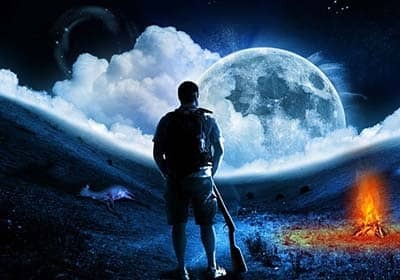 It is not obligatory to always follow the Moon phase, because eventually, you will arrive on one of those days and afterwards, you will find out that exactly those days have brought you the biggest catch. Write down everything concerning each day and soon you will be surprised that lunar days are more productive than the other ones. After all, it won't seem so complicated to you, like it was at the beginning. Quite soon, you will stick strongly to the lunar days only and will never miss a super fishing travel. There is nothing strange or difficult to make some experiments. Are you interested? Then try it! The success is guaranteed. It is pretty plain that if feeding the fish, you will receive the best chances of having a really big bite. It is better to do in the short period of time between the dawn and dusk. Nevertheless, you should consider the periods of moonrise and its set! The Moon has a significant impact upon the fish. Taking into account different factors concerning its life. Consequently, it is utterly important to remember the manifestations of the Moon phases, and when it is new and full. Sticking to those indications, you can tremendously enhance your chances for a very fruitful fishing. Other anglers will be amazed and puzzled why you always enjoy such incredible success. Have no doubts in that! As you have already figured out, time plays the most significant role in the entire story. You ought to know it precisely. Besides, there is nothing difficult about knowing when the sun goes down and the moon rises. You will have to keep in memory only 90 minutes of 24 hours, when the fish is very active. These are 45 minutes before and after each sunset and sunrise, as well as the rising and setting of the moon. Fishing while these four periods, you enhance your chances of catching much fish. However, fishing during the phases of the novel and full moon, you will enhance your chances twice as good or even more! If the issue rises what to choose - the rising and setting of the sun or the moon,it is always better to choose the moon, for it has affection that is more powerful. Therefore, you know when to start the fishing or hunting. Notwithstanding, the rising and setting of the Moon is not visible for the human's eye. Besides, different weather conditions can completely hide it. What to do in such situations? You simply have to remember the times of its activity and this it. Now, you are prepared for a beneficial hunting. However, there are some other indications that you should know about. Please, take to your consideration, that other factors play quite significant role as well. The very first factor is quite obvious, as it is weather. The weather alterations have a very noticeable impact upon all happenings. Right after a storm, it would be good to go fishing. In occasion, the weather is cold, the fish will dive deeper and you will hardly catch any. The activity lowers in such cases. Season is another important factor for successful fishing. These are mainly the periods when winter passes into spring, and spring into summer. Don't you ever forget these essential periods! And so, as you already know the most vital indications of a successful fishing, you can freely use them to your advantage. There should be no hesitations and restrictions. Use this knowledge wisely and you will surprise all the skeptics. Many who will be eager to know your secret, and that will be yours deal only whether to reveal what you know or keep it in secret. Experienced and successful hunters and fishers know when to act. The time of sunrise and sunset promises the best prizes.